German Talmudic scholar; born at Posen; died at Ottensee, near Hamburg, 1699. 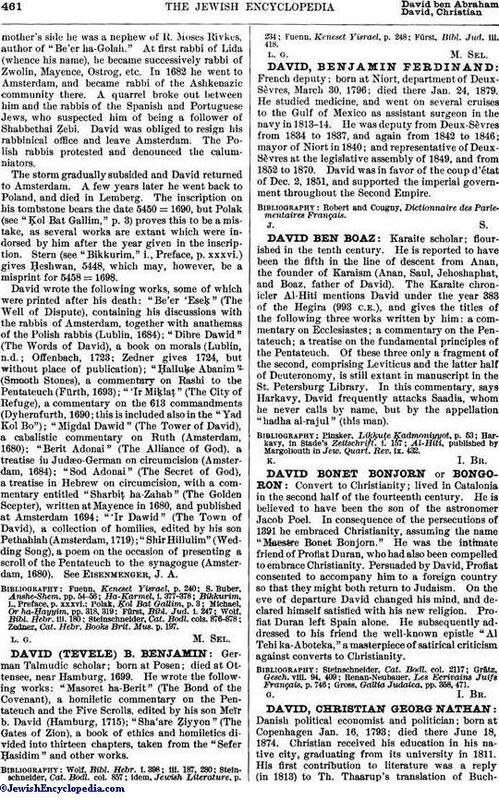 He wrote the following works: "Masoret ha-Berit" (The Bond of the Covenant), a homiletic commentary on the Pentateuch and the Five Scrolls, edited by his son MeÏr b. David (Hamburg, 1715); "Sha'are Ẓiyyon" (The Gates of Zion), a book of ethics and homiletics divided into thirteen chapters, taken from the "Sefer Ḥasidim" and other works. Fürst, Bibl. Jud. iii. 418.